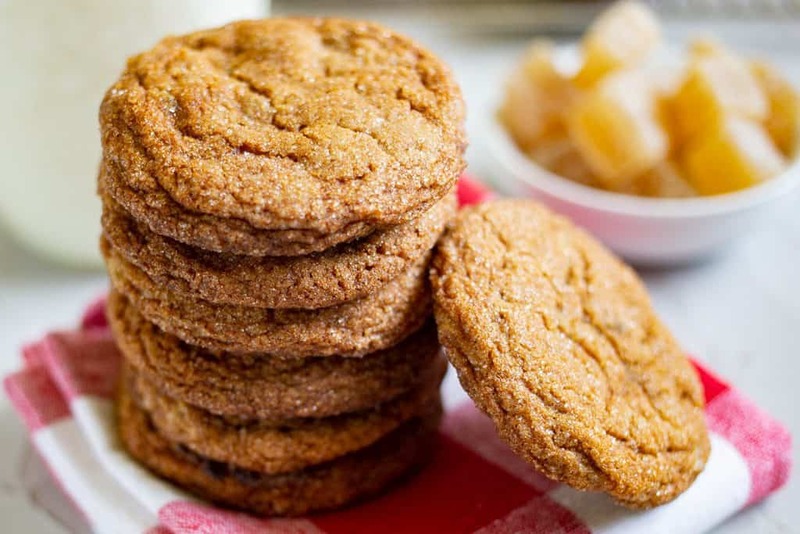 A recipe for crispy, spicy gingersnap cookies infused with molasses, cloves, cinnamon, and two forms of ginger. 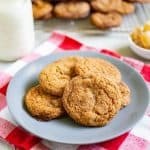 [social_warfare] My great grandma used to make gingersnap cookies every Christmas. While some Christmas cookies scream Christmas – I’m thinking peppermint candy cane sugar cookies, snowflake sugar cookies, and red and green anything – the warm, comforting flavors of ginger and molasses work well from fall into winter. Even though it’s still hot in Nashville, I’m craving fall flavors like these. 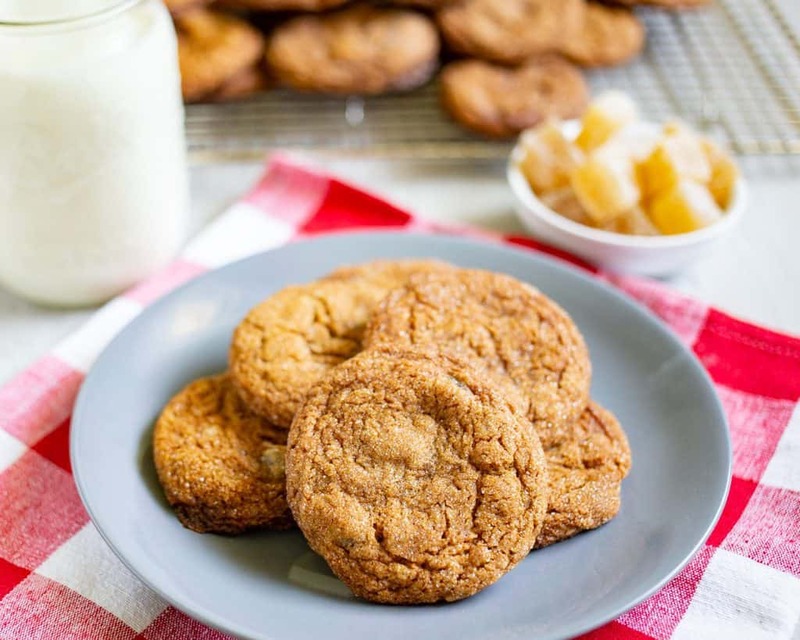 To up the spicy ginger flavor of classic gingersnap cookies, I included two forms of ginger: both crystallized candied ginger and ginger powder. Try these dipped in warm milk or tea. 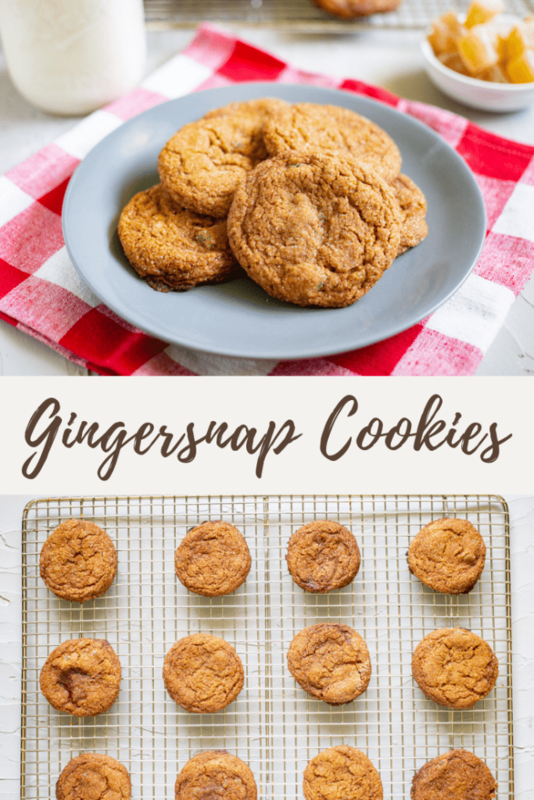 I love one-bowl dessert recipes like these gingersnap cookies that can be mixed by hand – no mixer required. The key to mixing these by hand is to make sure your butter is softened, otherwise you’ll end up with chunks of butter. Start by mixing sugar, softened butter, and molasses in a large bowl with a wooden spoon. Add an egg and mix well. Then add baking soda, finely chopped crystallized candied ginger, ginger powder, cinnamon, cloves, and salt. Mix well. Finally add in the flour and mix until just combined. Cover with plastic wrap and refrigerate for 15 minutes to overnight. Then when ready to bake, preheat the oven and roll the dough into tablespoon-sized balls. Put granulated sugar in a bowl and roll the dough balls in the sugar. Place on a nonstick baking sheet about 1 1/2 to 2 inches apart. Bake for 9 to 11 minutes. Allow to cool for a few minutes on the baking sheet and then move to a cooling rack to cool completely. This section contains affiliate links. See my disclosure policy here. A nonstick half sheet pan is perfect for making cookies and roasting veggies without needing any oil or parchment paper – the food doesn’t stick and cleanup is a breeze. I use these wire cooling racks to cool baked goods, from scones to cakes to pizza. Crystallized candied ginger can be tricky to find in the grocery store. In my store, it’s generally near the natural foods. If your store is out of stock, you can find it on Amazon here. 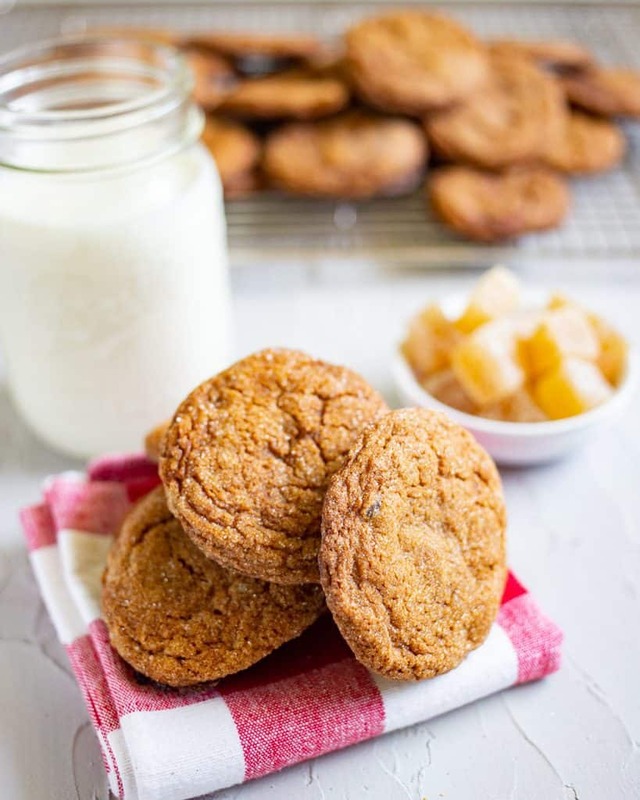 I use crystallized candied ginger in these gingersnap cookies, ginger peach scones, and like to eat it as a snack when traveling or hiking. Looking for more ginger forward recipes? Try these ginger peach scones or these ginger scallion noodles. Craving fall desserts? Check out this recipe for mini caramel apple cheesecakes. If you try this recipe for gingersnap cookies, leave a comment and review below and let me know what you think! Mix the brown sugar, softened butter, and molasses with a wooden spoon in a large bowl. Add the egg and mix well. Add the baking soda, crystallized candied ginger, cinnamon, ground ginger, cloves, and salt to the bowl and mix until well combined. Mix in the flour until just combined, being careful not to overmix the flour. Cover the bowl with plastic wrap and refrigerate for at least 15 minutes. Roll the chilled dough into tablespoon sized balls. Roll the balls in granulated sugar then place on a baking sheet about two inches apart. Bake for 9 to 11 minutes. Allow to cool for a few minutes then transfer to a cooling rack to cool completely. I love gingersnap cookies! These look so delicious and perfect for the season! Oh wow they look fantastic, gingernut biscuits were my favourite growing up in the UK, these sound very similar in terms of flavour! I ate so many of these when I was pregnant, so they bring back happy memories. Love any kind of ginger dessert. I’ve been looking for a packed lunch sweet treat recipe so this is perfect timing – thank you! These look so much better than shop bought, I need to try them! I’ve always liked the spicy warmth from gingersnap cookies. I can just imagine these with a cold glass of milk. Yummy! I have been looking for a good recipe for these cookies. Been craving them lately. Oh my, LOVE the chrystalized ginger in here… and cardamom too??!! These are going to be fantastic! I love ginger cookies and I see you use crystalized ginger which I eat all the time, it’s so good. Your cookies would be perfect with my hot cup of tea right now. These gingersnap cookies look amazing and if it’s a ‘Grandma Recipe’ then it’s a win for sure!! Gingersnap cookies bring back so many childhood memories! I also go for that orange and black box at the store, but have never tried making my own! Saving this recipe to try asap!